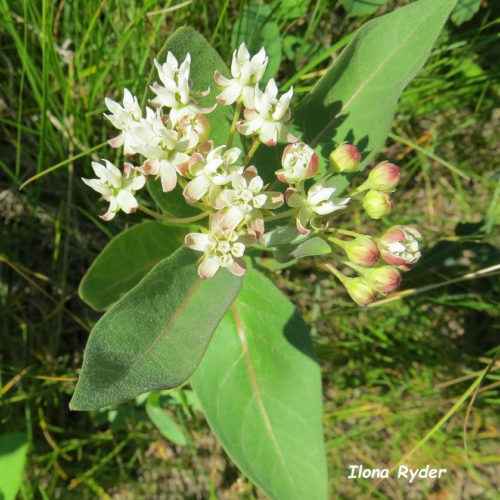 Oval-leaf Milkweed (Asclepias ovalifolia) is a related species—smaller, with more oval leaf shape and greenish-white flowers. 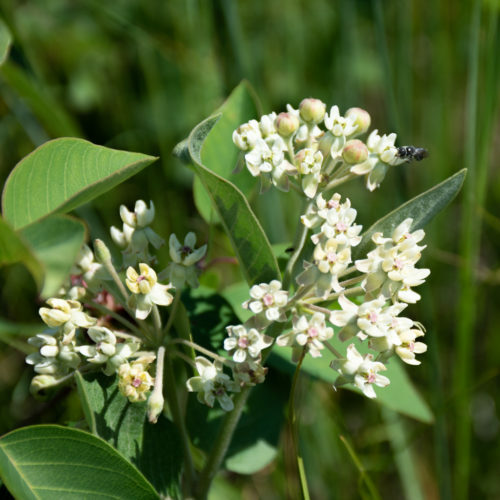 “Milkweeds are pollinated by insects that get little horseshoe-shaped pollen-carriers called pollinia clipped onto their legs as they enter the flower. They must break the pollinium free to leave. Some cannot and are trapped. The rest fly to other milkweeds, where the pollinia detach upon entry just at the right spot for fertilization. Smart flowers!” (Gadd, 339). In southern Alberta*, this plant is part of a bigger design. The Eastern Monarch butterfly** lays its eggs (300 to 400 each) on the underside of milkweed leaves. As the larvae feed on the plants, they accumulate the poisonous glycosides, to which they are immune. Birds do not like the taste of these chemicals and therefore avoid eating the monarch larvae and butterflies. Declining occurrence of milkweed in North America directly impacts this beautiful insect (Nature Conservancy, 13; Parish, 249). * Monarchs are most common in Alberta near the U.S. border where milkweed is abundant, but they have been seen as far north as Edmonton (CBC). **The Eastern Monarch ranges from Alberta to the Maritimes and winters in Mexico. Western Monarchs occur in British Columbia and migrate to coastal California in winter. CBC News Story “Project aims to help save monarch butterfly” June 12, 2016. Nature Conservancy Canada magazine. Summer, 2018. Parish, Coupé, Lloyd. Plants of Southern Interior B.C. Found late June along the Pipestone Creek trail, on the sunniest, driest slopes high above the creek.